With a combined 288 rooms and suites, this is the first-ever combination of the AC Hotels by Marriott and Moxy Hotels brands under one roof. Noble Investment Group and Marriott International yesterday announced the opening of the dual-branded AC Hotel Atlanta Midtown and Moxy Atlanta Midtown in the heart of Midtown&apos;s business and arts district. With a combined 288 rooms and suites, this is the first-ever combination of the AC Hotels by Marriott and Moxy Hotels brands under one roof. These new additions mark the first Moxy Hotel in Georgia and the third AC Hotel in Atlanta (Noble&apos;s second after the AC Hotel Atlanta Buckhead at Phipps Plaza). Developed on an entire city block between 14th street and 13th street flanked by Peachtree Road and West Peachtree Road, the LEED-certified hotels are central to Midtown&apos;s business and commerce hub, a few blocks from Georgia Tech University and in the heart of the region&apos;s arts district which include The Woodruff Arts Center (High Museum, Alliance Theatre, Symphony Hall), Museum of Design Atlanta, The Fox Theatre and The Savannah College of Art & Design. "We are thrilled to have two of our lifestyle brands join forces in Atlanta to provide travelers with two very distinct options while visiting the city for business or leisure," said Toni Stoeckl, Vice President, Distinctive Select Service Brands, Marriott International. "With Moxy we threw out the hotel rulebook to create a bold new hotel experience geared toward guests who are looking for shareable, experiential moments when they travel. AC Hotels are designed more for those who want a moment of respite among the hustle and bustle of the city  the opportunity to reflect in an elegant, peaceful space with frictionless service." Facing 14th Street, the European-inspired AC Hotel Atlanta Midtown offers 133 rooms with sophisticated, sleek design elements; plush seating; and multifunctional workspaces. Playing off the muted palette of the interiors, the hotel showcases abstract sculptures that speak to the motion and fluidity of a dance, inspired by its location in the epicenter of the arts. 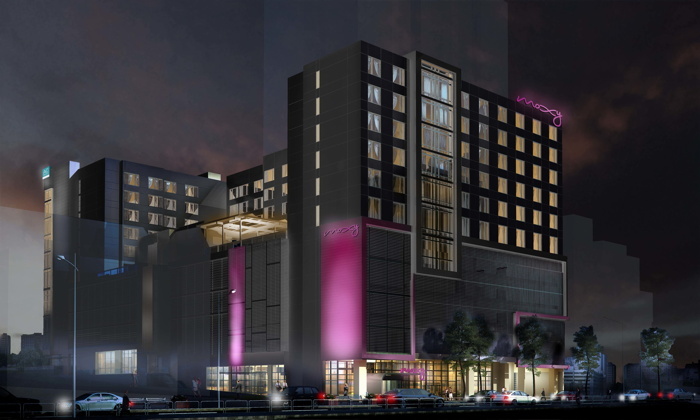 Neighboring spaces such as the High Museum, Fox Theater, Woodruff Arts Center, Alliance Theatre, and Krog Street Tunnel serve as the inspiration for the hotel&apos;s "Gallery of the Arts" concept. A simple, yet sophisticated palette of mixed metals reflect the urban city of Atlanta. Tones of black, white, brass and silver art are harmonized throughout the hotel. Bold mural-style pieces, refined metals and expressive sculptural elements mingle to create movement from dance and theater performances. Facing 13th Street, the experiential Moxy Atlanta Midtown Hotel offers 155 rooms and communal areas with industrial features including reclaimed pallet ceilings and iron finishes. Guests will check-in at Bar Moxy and be welcomed by a complimentary cocktail, mocktail or coffee. The artwork is playful and captivating, including "Welcome Home," a 54-foot long mural by renowned Atlanta artist, GREG MIKE, which takes center stage in the lobby. Inspired by the "True Colors" mural he painted on Atlanta&apos;s iconic Ponce Wall in 2015, this site-specific mural features his signature large format black and white bear peering over couches. "Both the AC and Moxy hotels have their own distinctive style and vibe which will complement and enhance Midtown Atlanta&apos;s standing as a premiere destination for commerce, culture, education, living and visiting," said Tim Dahlen, General Manager. Above both hotels is High Note, a vibrant rooftop featuring pool, cabanas and bar, meeting space, state-of-the-art health and fitness and an outdoor entertaining area with firepits. Additionally, both hotels provide outstanding food and beverage service  European-style offerings from Executive Chef Jeremy Hartman at the AC, and fun naan bread specialties and kombucha on tap at the Moxy, as part of the brand&apos;s 24/7 self-service B&F program. McKibbon Hospitality will be the operator for both hotels. Working alongside the Midtown Alliance, the hotel has established a pedestrian connector called the Arts Walk. The hotel&apos;s ground-level path will provide connectivity between 13th and 14th Streets while featuring installations from local artists. The Arts Walk will eventually span from 10th Street to the Woodruff Arts Center. Are you with Noble Investment Group? If you are a member of Noble Investment Group you may be interested in learning how to optimize your content on our network.